Stretching across the slopes of the Meratus mountains, where the indigenous Dayak people strip rubber and harvest mountain rice, Central Hulu Sungai is the last district in Indonesia’s South Kalimantan province free of mining and palm oil. Locals in this remote part of Indonesian Borneo say protecting their land has tested their stamina, and they’re worried they may no longer be able to hold out against a new threat.In Indonesia, local governments retain broad rights to decide the fate of their land, and the struggle to curb questionable land deals often pits regulatory agencies in Jakarta against lax enforcement by provincial officials. But here in the forested slopes of Batutangga, a collection of villages islanded by karst towers, local people have found the opposite. In December 2017, despite the objections of local officials, the central government issued a mining permit to PT Mantimin Coal Mining (MCM), a nebulous coal company that has been trying and failing to obtain the required environmental impact assessment (EIA) for a decade. Locals quickly organized protests, and the environmental NGO Walhi in late February sued the Ministry of Energy and Mineral Resources for allowing Batutangga to be mined. Indonesia’s environmental laws require mining companies to present an EIA before they can be considered for a permit. Walhi argues in the lawsuit that the ministry not only ignored the legal process to grant a permit but also the concerns of residents. Any EIA, they maintain, would be illegal because it would not have the approval of the district. Additionally, roughly 100 hectares (247 acres) of the 1,964-hectare (4,853-acre) Batutangga concession area overlaps with protected forests. “Not only should the laws be considered, but also that the community has been fighting against it from the beginning,” said Kisworo Dwi Cahyono, director of Walhi in South Kalimantan. Bambang Gatot Ariyono, director general of minerals and coal at the Ministry of Energy and Mineral Resources, who signed the permit in December, refused to answer questions about the lawsuit, saying they would be answered later in court. Women in Nateh, one of several villages in the concession area, where 8,000 people live. Photo by Ian Morse for Mongabay. Aribani, the head of the Nateh village council, said he learned about the permit in February, two months after it was signed. Before then, he believed mining would never enter these mountains. He laughed when asked whether he was involved in the permit process at all. Aribani is not alone. In addition to the 8,000 residents in the concession area, provincial officials were also surprised the permit was granted to PT MCM. According to residents and government officials, the company has never been to South Kalimantan, despite seeking support for a permit since 2008. Gunawan Harjito, head of minerals and coal in the province’s Department of Energy and Mineral Resources, said he had never met the company and didn’t know how to get in contact with them. “But if it is mining they are doing in our region, the owners need to come visit,” Gunawan said, confirming his support for the lawsuit against his department’s national equivalent. According to government documents obtained by Mongabay, PT MCM has been listed as a mining company since 1993. After the firm received a permit to begin exploration in 2008, its Indonesian owners sold most of their shares to an Indian company, PT Bangun Asia Persada (BAP), an investment holding company owned by Infrastructure Leasing and Financial Services in Mumbai. It is IL&FS’s only holding in Indonesia. IL&FS did not respond to repeated requests for comments, nor did Amit Ganguly, the current president of both PT MCM and PT BAP. When contacted by telephone, a representative of PT MCM directed communications to email, which have not been answered. Since 2010, PT MCM has changed executives nine times, apparently without having an operating coal mine. The latest government documents show that as of September 2017, South Kalimantan mining giant Hasnur Group held a 5 percent stake; when contacted in March, an operator at the Hasnur Group office said the company had divested completely. Sabriyansa manages the water system for the network of villages and was traveling with Aribani. He said he was sure the villages’ only source of fresh water would be contaminated by the mine. “We will have to use chemicals to clean the water. And for that we will need more money,” he said. Sabriyansa said he was worried the river would quickly dry up, but locals said they also feared intensified flooding. A mine would disrupt the natural water absorption area in Batutangga, noted in the district’s 2015 planning reports. Rainwater would be displaced further downhill to the city of Barabai, where roughly 60,000 people live. “Barabai will surely flood because the city is indeed at a low-lying point,” said Rizqi Hidayat, deputy director of Walhi in South Kalimantan. Floodwaters would likely halt rice farming in the paddies outside the city, too, he said. “If this mine happens, Barabai might drown, as well as lose their water,” said Muhammad Yani, the acting head of the district’s environmental agency. The acting district head, H.A. Chairansyah, said mining was sure to disrupt the 500 billion rupiah ($35 million) irrigation system the central government recently helped build in the district. “This is our cultural forest, not a national forest,” proclaims a sign on the road leading to Kiyu. Photo by Ian Morse for Mongabay. 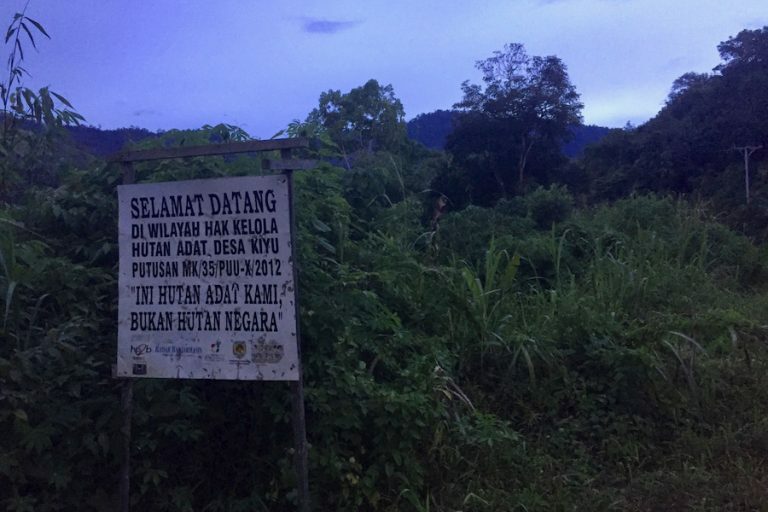 “This is our cultural forest, not a national forest,” reads a sign on the road to Kiyu, a Dayak village whose residents comprise three religions, including Kaharingan, a set of beliefs not recognized by the Indonesian government. At dusk, only a few lights stand out among the forest; while PT MCM has been eyeing Kiyu’s coal for over a decade, the village only received electricity last year. Kiyu residents remember when a logging company cleared the Meratus hillsides of trees in the 1980s and caused financially devastating flooding two years later. But residents of this village are most afraid of the threats to their culture, which is inextricably tied to the nature around them. 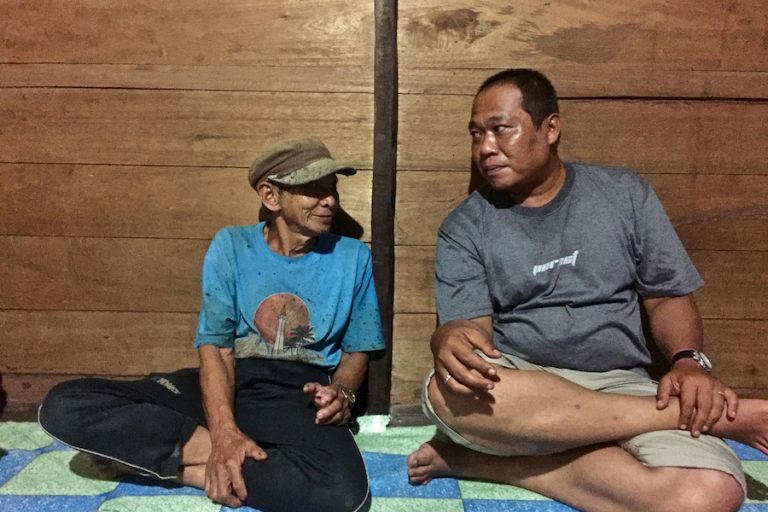 Rudi Riza (right), a member of GEMBUK and a disaster assistance group, sits with Jeluk Meribut (left) in Kiyu. Wearing a shirt depicting Jakarta’s famed Monas monument, Meribut spoke of being neglected by the central government. Photo by Ian Morse for Mongabay. The Dayak people of Kiyu hold ba’aruh ceremonies, customary four-day events to mark significant events like harvests, said cultural leader Jeluk Meribut, who said he turned 100 in 2008. On the last day of the rituals, they abstain from using their environment so that they are closer with their creator. In 2016, the district government issued a bylaw to protect their culture. “Everything in the forest here has its own function, and it is sacred,” said Meribut. 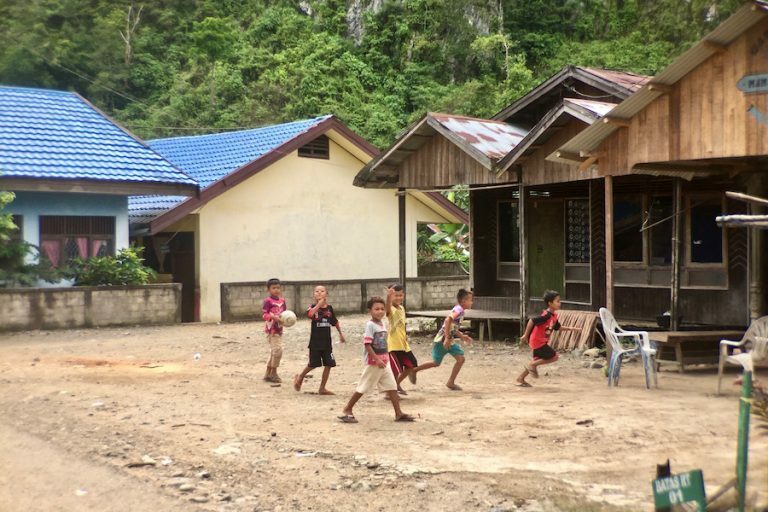 Residents of Barabai often point to the cautionary tale of Wonorejo, a village next to a coal mine operated by PT Adaro Energy in a bordering district. “We’re scared because of the story of Wonorejo,” said Rubi Putra, head of the local affiliate of AMAN, Indonesia’s national indigenous peoples’ organization. “The funds they got from the company couldn’t even be used. Why? The village didn’t exist anymore. All land was gone. The Meratus Mountains, South Kalimantan. Photo by Ulet Ifansasti/Greenpeace. 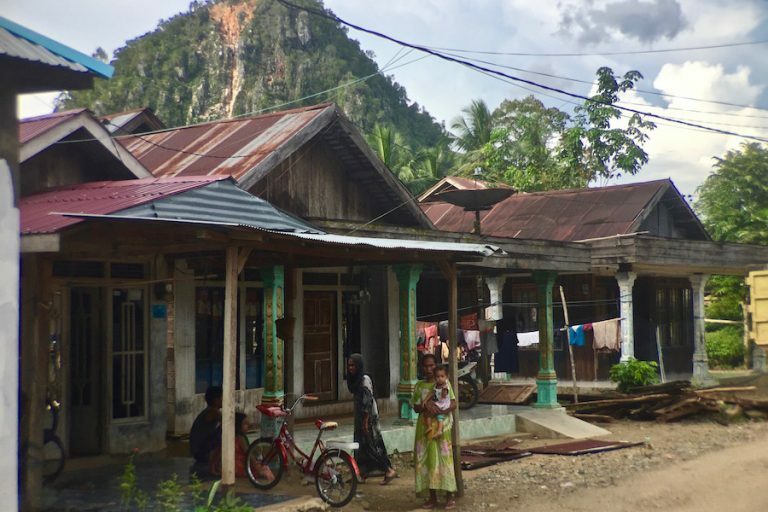 Officials and activists in Central Hulu Sungai said they believed they had set up all the necessary defenses to prevent PT MCM from mining in their district. Three development plans forbid mining, and the district government has since 2008 rejected multiple requests to support PT MCM’s EIA. As recently as February 2017, PT MCM requested support again. The district responded the next day with a rejection. Although an EIA is required during the decision-making process of issuing permits, two provisions in Indonesian law appear to have allowed PT MCM to circumvent this obligation. First, in 2010, PT MCM registered as a foreign company, following its purchase by India-based IL&FS. As such, according to the ministry of mineral resources’ Bambang, responsibility for issuing the company’s mining permit fell to the central government, rather than to regional authorities. Then, under a regulation passed in May 2017, seven months before PT MCM’s permit was issued, it became easier for companies to lump together multiple coal concessions into one permit. The new regulation simplified mining permits from more than five categories into just two. The first, for permits in the early stages, allows companies to carry out general surveys, exploration and investment. The second includes production and construction. Under the new law, if a company has multiple concessions at different stages – for example, one still in the exploration phase and another with the EIA required to operate — a single permit issuance will bump all concessions up to the higher level. The provision only applies to coal mining. When asked why the regulation was introduced, Bambang cited simplification. 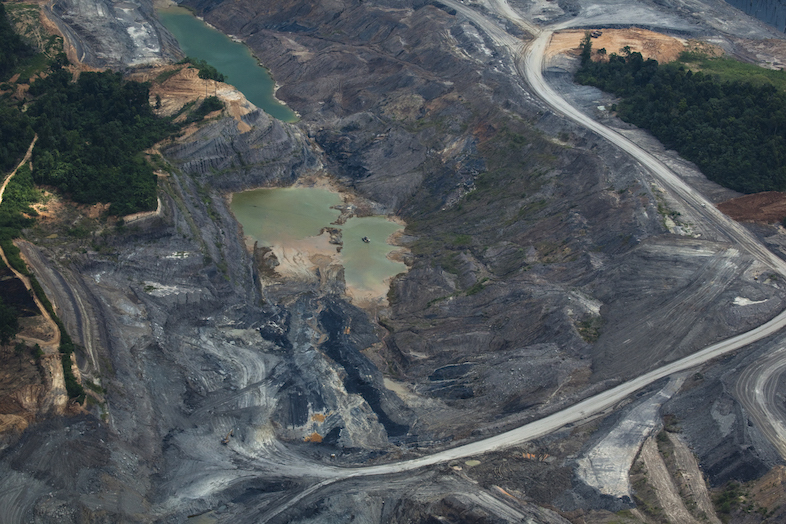 Aerial view of thePT Borneo Indobara coal mine, in the Asam-asam Basin in the southeastern Meratus Mountain. Photo by Daniel Beltra/Greenpeace. When the Ministry of Energy and Mineral Resources granted the permit to the Batutangga block last December, it was included with the permit for Upau, another PT MCM concession 40 kilometers (25 miles) away in two other districts that support mining. Upau already had an EIA, and so Batutangga was granted the same permit as Upau: mining operation and production. The regulation was part of efforts begun last year to simplify and speed up the permit-issuing process in other mining sectors. By contrast, the Anti-Mining Mafia Coalition, a group of NGOs including Walhi, has urged Indonesia’s anti-corruption agency, the KPK, to tighten the permit process after it was revealed that over 700 mining permits were rescinded or not extended in 2014 and 2015 after showing funding irregularities. Almost 70 percent were coal permits. 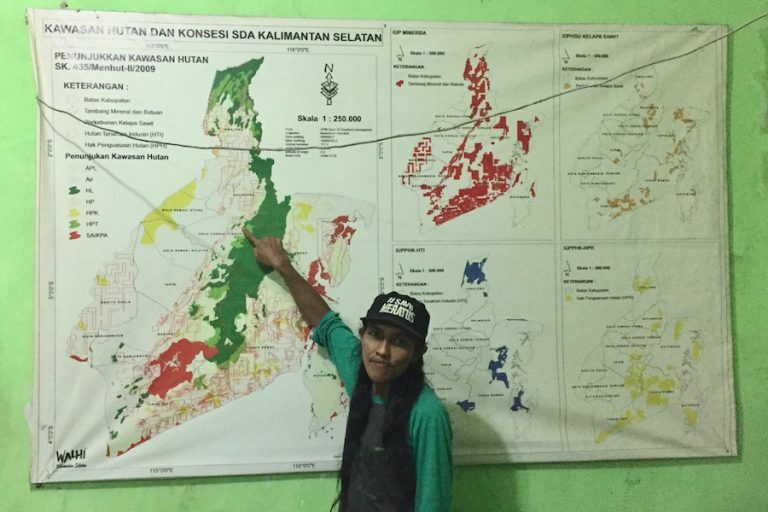 Director of Walhi in South Kalimantan, Kisworo Dwi Cahyono, points to the Batutangga concession area on a map in the Walhi office in Banjarbaru. The Meratus Mountains and Central Hulu Sungai district stand out as green spaces in a province that is otherwise a mosaic of plantations and mines. Photo by Ian Morse for Mongabay. In Kiyu, Meribut told the circle of residents they had few tools to fight back. They traditionally punish wrongdoers with tahil, a payment of rice or iron that has more recently become monetary fines. Rusli, a middle-aged farmer, said that compensation for land was out of the question. “If we accept the compensation, even if 1 billion [rupiah, about $73,000] for one family, how far does that go?” he asked. “As far as our grandchildren? Over 10 years to 10 families? Kisworo, the provincial Walhi director, first formed the Save Meratus alliance in 1999, when a logging company sought to enter the mountains. In 2009, he and Walhi took to the streets to protest PT MCM’s 2008 exploration permit. A decade later he’s back, just with new protest signs. “It’s easier to understand what’s happening now with an analogy,” he said. “South Kalimantan is a house. The floor and the walls are already destroyed by palm oil and coal. What’s left? The roof — the Meratus Mountains at the top.” A map of mines and plantations hangs in Walhi’s office. The mountains stand out alone among the red borders of mines and colorful contours of plantations. Bambang said PT MCM would not be allowed to mine until it had an EIA. According to Gunawan, it is up to the district to enforce the policy, but past cases have shown residents that the district’s fate is precarious. District head Abdul Latif, a long-time opponent of palm oil and coal mining, was arrested for corruption, and duly suspended, a week before PT MCM’s permit was publicized. Children at play in Nateh village. Photo by Ian Morse for Mongabay. Chairansyah, the acting district head, vowed to refuse to grant an EIA. Muhammad Yani, acting head of the district’s environmental agency, controls the district’s final say on an EIA and said there would be no mining in Central Hulu Sungai as long as he was alive. Environmental activists in Barabai, however, fear an EIA is easier to come by than the law permits. They point to a recent case in Jakarta where a city councilor was sentenced to seven years for taking a bribe from a company that had failed to present an EIA before operating. “We have to have a powerful resistance for a long struggle,” Yani said. PT MCM can, within national law, dig up the villages in Batutangga to mine coal until 2034. Rumli, head of the Barabai environmental union GEMBUK, joked that a kind of “war” might be required to fight mining, but remained positive. He said a petition by GEMBUK calling on the ministry and president to rescind the permit had reached 40,000 signatures, mostly from locals. “The last time with palm oil, the people fought back and the permit was rescinded. We can be optimistic with ‘people power,’” he said.